Cruden Farm is located less than an hour from Melbourne and is accessed by a straightforward trip along Eastlink, take exit 28 to merge onto Peninsula Link/Mornington Peninsula Fwy/M11 towards Portsea. Take exit 13 (left) for Cranbourne Rd , continue over McClelland Drive and Cranhaven Road is the first entry on your right. 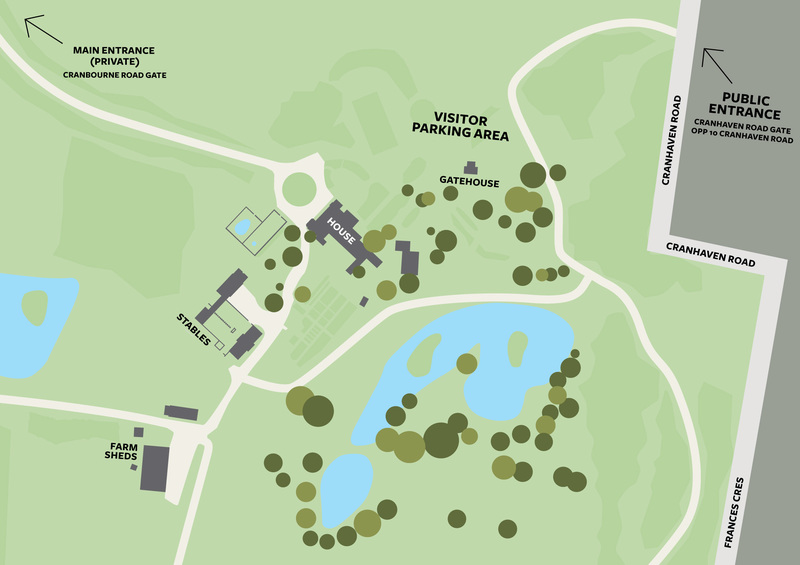 Cruden Farm has three different entry points but the CRANHAVEN ROAD gate is where we welcome members of the public onto the property. Be aware that your smart phone may direct you to another entry point but only the Cranhaven Road gate (located opposite 10 Cranhaven Rd) will be open. Delivery trucks must access Cruden Farm via the McClelland Drive gate. From Melbourne, catch a Frankston train to Frankston station. From Frankston, bus routes 771, 789, 790 & 791 all pass Cruden Farm. Alternatively, catch a taxi from the train station (approx. 5km).